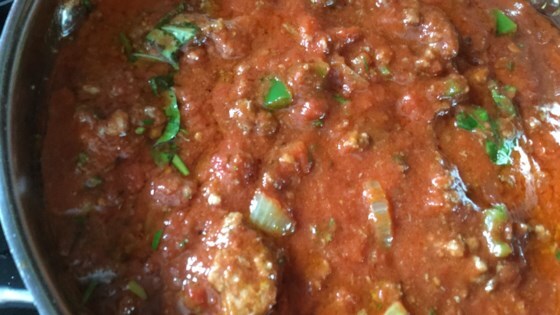 "Slow cooked sugo (spaghetti sauce) just like Nonna's." In a medium skillet, cook sausages over medium heat until juices run clear. Drain, and cut into bite sized pieces. Set aside. In large (13 quart) stock pot over medium heat, saute onion, garlic and crushed red pepper in olive oil until golden brown. Stir in sausage pieces, half the oregano and half the basil, and cook 10 minutes. Stir in the tomatoes, increase the heat to high and bring to a boil. Stir in the remaining oregano and basil, reduce heat to low, and simmer 90 minutes, stirring occasionally. Pour in the red wine, and with a handheld mixer, carefully blend the sauce in the pot until the tomatoes have been chopped into small pieces and the sauce is thick and chunky. Serve. Need just a little sugar added to the mix. Other than that it is a good sauce. Freezes well and tastes better the next day. Too much oregano for my taste-I froze it in quart size bags & add a large can of crushed tomatoes and simmer a while before serving. Flavor of this recipe is so-so. With this much garlic there is a long lingering bitter after taste that is not pleasing.